The Pedestrian is an excellent blog providing insightful pieces on Iranian culture, politics and life. Highly recommended by Iran News Now. 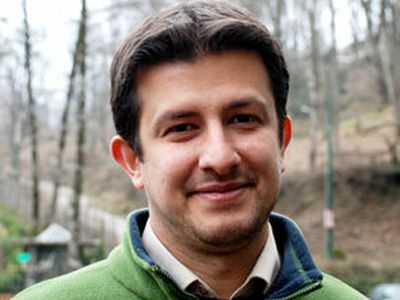 Emad Bahavar  is a political activist, writer and the head of “Supporters of Khatami and Mousavi” in the 2009 presidential campaign. He was arrested shortly after the election, and released after two months. He was detained once more, four days ago. And released yesterday. His recent article in Roozonline, “The destination, was to begin the journey” was the reason behind his recent arrest. I think it is an extremely poignant, intelligent piece. Here is the complete text of the article. The two last questions (in green) are what I have added from yesterday. It is now quite obvious that what happened before and after the presidential election was a result of a very clumsy solution devised by security and military forces, to solve the “crisis of leadership” in the future system of the Islamic Republic. A solution that did not solve the crisis, and in fact, inflicted irreversible injury and damage to the very structure and legitimacy of the political system. The ruling elite try to deny the existence of any political crisis, and to show that indeed it is the reformists who have reached a dead end. But analyzing their behavior and their responses to the aftermath of the election and the “green movement”, proves the opposite. A “political crisis”, in its most urgent form presents itself as a “crisis of legitimacy”, and a “crisis of legitimacy”, at its worse, becomes a “crisis of leadership”. Thus, not only is the system in a political crisis right now, this crisis is no ordinary quandary and is the worst of its kind. “Who will be the next leader?” “What sort of mechanism will be used to choose the next leader?” “Is the current system of Leadership of the Jurist, in the current context of the constitution, sustainable?” These are questions which reformists, principalists and conservatives have been grappling with. The events of the recent election are in a way the product of different groups thinking of these questions. The events are in fact, a direct result of “serious measures” taken by the most hardline base of the establishment, in response to those questions. The result of the explosive, destructive actions following the election brought to light the very fact that a solution to these questions is not possible by “simple minded solutions” and the “crisis” and “dead end” argued here is much more serious to be solved by an adventurous wing of the establishment on its own. These events first seriously began when the most hardline wings of the system, composed of military groups, quasi-miliatry groups and extremist clerics, devised a strategy for “the transfer of leadership”. When Ayatollah Khamenei began his leadership of the country, most groups in the ruling establishment formed a consensus on his appointment and by acting above and beyond any faction or group, he was able to give the system relative stability and solidity. The election of a reformist president during his time, also gave many groups the belief that there is a chance to be active in the system and to reform it, without jeopardizing the stability of the entire system. But there was no guarantee that this stability would continue on forever. There was no guarantee that when it came time to transfer the leadership to a “new leadership”, the same political stability would remain. By all accounts and all analysis, the system would experience great tension during this period and this tension might undermine its very existence. That is why all political factions within the system, from reformist to conservative to hardline, attempted to put forth a solution to this quandary in the frameworks of their own beliefs. For reasons of which I can not write about, it was the hardliners who were given the opportunity to carry out their solution. They were appointed to establish a “military rule”, a homogeneous ruling system empty and silent of dissent, to create an appropriate circumstance for the period of the transfer of leadership. This is how in 2005, “Mahmoud Ahmadinejad” was chosen to serve as president and to prepare suitable conditions for this period. What was the hardliners’ solution? The worst kind of political stability is when the future of an entire system is put to depend on the future of one person, because the smallest change in the top of the hierarchy will influence the entire system. In a monarchy, this quandary has been relatively solved by hereditary rule and the selection of the children or kin of the monarch as the next rulers. In this system, the death of the king and the succession of his son is seen as a legitimate, natural process, and does not undermine the entirety of the system. But in the current ruling system of the Islamic Republic, the mechanisms are neither monarchical or democratic. From one angle, it seems that the Assembly of Experts is chose by the nation to elect a leader, from another angle, the approbation supervision of the Guardian Council over the members of the assembly, means that a substantial number of the nation’s real representatives never make their way through and thus have no say in the selection of the leader. Thus, the very principal of legitimacy and admissibility of the leader by the people [in the tradition of democratic systems] is undermined with the role of “approbation supervision” of the the Guardian Council. So what was the solution the hardliners put forth? As we know, the hardliners follow extremist clerics like Ayatollah Mesbah Yazdi, who never believed in the selection of the leader by the Assembly of Experts, and has always disapproved of this article of the constitution. The emphasis of Ayatollah Yazdi on the appointment of the leader is based on a theory of “seeking and appointing” – not electing. Thus, the solution of the hardliners for the transition process is something like a hereditary monarchy, with the different that the new leader does not necessarily have to be next of kin. In the view of Ayatollah Yazdi, the current leader has ways to seek the opinion of the twelfth Imam [who will return from occultation one day], and when notified of the Imam’s choice, inform the Assembly of Experts. The Assembly of Experts will in turn swear allegiance to the new leader on behalf of the nation and through this mechanism, the people’s approval will be satisfied. Thus, the new leader will be appointed by the old one (he will be “sought and appointed”), will have holy legitimacy, and through the approval of the Assembly of Experts (an indirect swearing of allegiance by the people) also have the people’s approval. The belief of the hardliners is noting but a recreation of theory of the caliphate. The Assembly of Experts and parliament are nothing but a seal of approval for the caliphate. Hardline Shi’as in this way are very similar to hardline Sunnis. They believe that by implementing these theories, the tensions during the transition period will reach a minimum, and these tensions will be limited to insignificant political dissent and disapproval. In this way, the old leader will appoint the new one, and the Assembly of Experts will approve. But the real quandary for the hardliners was implementing these plans, not writing them, as they had been written long ago, from the time of Sheykh Fazlollah. How can it ever be brought to fruition in the time of reformist publications, numerous newspapers, well known intellectuals, and clerics deeply opposed to such views? Is the implementation of such a project possible in such a pluralistic, politicized environment? How did the hardliners’ project begin? The hardliners were appointed to create a military government, homogeneous and clear of dissent, to pave the way for the new leadership. For this purpose, Ahmadinejad was chosen as president in 2005 and most of the positions on his cabinets were taken by former military officials. The hardliners’ plan was written out in “two parts”, for two presidential terms. In his first term, Ahmadinejad was appointed to either control or destroy the potentials created in civil society during the reformist era. The aim of this period was to “return to square one”. In this period, student associations, NGOs, political parties and the press were put under excruciating pressure, to attempt to return to the pre-1997 era [before Khatami]. The most important part of the project however, was to do with Ahmadnejad’s second term. The second term was a “period of elimination”. Two groups of political players had to be eliminated. One group which was a “barrier”, and one group which was the “goal”. The reformists were a barrier to the hardline project. It could be predicted that they would be vocal in their opposition to election fraud. So a scenario was written to widely arrest and eliminate the reformists, by accusing them of a “velvet revolution” and “soft overthrow”. A second group which was to be eliminated consisted of moderate conservative politicians who had traditional been an ally to Rafsanjani. The goal was to eliminate Rafsanjani and his allies, because, in the view of hardliners, this group would have a big role in determining the next leader. Before the election, and in Ahmadinejad’s first term, there was great effort to take many of Rafsanjani’s close allies to court, people like Rowhani, Mousavian and Mehdi Hashemi. And that attempt was not very successful. The process of eliminating Rafsanjani was to begin with Ahmadinejad’s televised debate, and by firing up the nation, it was to be carried out swiftly. Thus, by imprisoning more than 500 political and civil activists, and eliminating conservatives from the top of the ruling establishment’s hierarchy, a suitable environment for the period of transition was to be prepared. In such an environment, there would even be an appropriate chance for changing to constitution to be more inline with the principle of “seeking and appointing”. But as we saw, all did not go according to the hardliners plan. The green movement was born. The discussion about how the green movement was born requires a lot more space, and will not be the focus of this article. But what is quite obvious is that this movement was a blow to the hardliner project which they had been planning for years. Not only did they not achieve an appropriate environment for transferring leadership, but rather, the political landscape of the country was badly shaken. The hardliners expected to see hopelessness and silence from political activists and the public, after a brief period of protest following the election. But just the opposite happened. The protests saw no end and they became louder and louder every day. Even those people who had previously been apolitical and disinterested, got involved. Thus, not only were the political not silenced,the apolitical became active as well. The hardliners project was defeated. The reformists stood their ground and did not back down. Imprisoning the reformists was not a victorious strategy, and did not have the desired result. The resilience of some reformists actually gave more life to their cause. Rafsanjani with his insightful brilliance, deterred any attempts by the hardliners to be eliminated. Not only did he not lose his position, he wisely kept his distance with the leadership. The hardliners solution for this period of transfer was a simple minded “the use of brute force”. They assumed that technology and money would be enough. But the result was just the opposite of what they had planned for. The legitimacy of the system was greatly tarnished, and over night, its national and international appeal was damaged. Many of the system’s previous supporters became doubtful. The stability of the system was greatly undermined and the fracture between the people and the political elite became wider. Thus, the effort of the hardliners was to return things to the way they were before the election. They tried to substitute their betrayal of the nation with violence. But whatever they did, it created a worse situation. The blow that the hardliners forced on the system was worse than what any opposition could do. The damage and destruction brought on the system after the election was the sole responsibility of military and quasi military forces which were the masterminds of the project. Only relying on their might and financial backing, they jeopardized the very existence of the system. What was the role of pragmatic conservatives? Last year, a group of conservatives had sent a message to reformists, asking them not to announce a candidate for the presidential election, and instead to back the conservative candidates (someone like Qalibaf, Larijani, etc). The argument was that if the reformists have no candidate, there will less of a consensus on Ahmadinejad, and the moderate conservative would win. In the view of these pragmatic conservatives, that was the only way to unseat Ahmadinejad. The reformists of course turned down this offer. In their view there was no way to be sure that a consensus around Ahmadinejad could be broken. The conservatives took orders after all, and the harliners were bent on keeping Ahmadinejad in power. The only power that could unseat Ahmadinejad would be a nation wide momentum, like that of the 2nd Khordaad [when Khatami was elected], not backroom deals between political factions. Thus, the reformists put their efforts in nominating Khatami again, and recreating 2nd of Khordaad. Now, after nearly a year, individuals like Ali Motahari send letters to Mousavi and ask him to back down, and leave the job to moderate conservatives. The likes of Motahari argue that so long as the reformists are active, the hardliner and conservative consensus around Ahmadinejad will not be broken. But if the reformists back down, the conservatives themselves will take care of Ahmadinejad. This time too, the reformists and Mousavi’s response was negative. If Karoubi and Mousavi back down, not only will this not weaken Ahmadinejad, it will allow for a swift move on the part of hardliners to eliminate conservatives as well. The only reason that Rafsanjani’s allies and moderate conservatives have gone unscathed is that the hardliners have been busy with the repression and silencing of the green movement. The pragmatic conservatives underestimate the hardliners. If the hardliners remove the “barrier” that is the green movement, they will go straight for the conservatives. We must not forget that the actual aim was Rafsanjani and his allies, and the project remains unfinished. If the hardliners are not deterred, the pragmatic conservatives will not fare any better than the reformists. During the months following the birth of the green movement, pragmatic conservatives tried to steer clear of the fights so that the two reformist and hardline factions would wear each other down. So that once both these factions were completely weakened, they could emerge as “the third force” or “saviors” and take control of government. But what happened was that the conflict between reformists and hardliners grew worse by the day and the political landscape was becoming ever more polarized and radicalized to a point where the entire system was at risk and there was no place for the conservatives. That is why these conservatives decided to play a role in the events, after seven months of silence. A mediating role. The letter Mohsen Rezaie wrote to the leader, their attempts to reform election laws and to take Saeed Mortazavi [Tehran ex prosecutor general] to court, an attempt at changing the head of the police forces and the IRGC, parliament’s reports on government’s violations of law, their efforts to free imprisoned reformists and their numerous interviews in criticizing the government were all efforts on the part of pragmatic conservatives to end the conflict. Their efforts became more apparent after 22 Bahman [31st anniversary of the revolution]. The events of 2009 were a result of the deadlock in the reformist movement between 2002-2006. Who can clearly guess the repercussions of eliminating the reformists all together? The silencing of the symbols of the green movement has not destroyed that movement, but taken it to the inner layers of society. The green movement was beyond just “street protests” to be killed off when protests were no longer possible. The demands of this movement are very serious and the lack of a response to them leads the way for possible future political crises and more tension. Right in that moment when the hardliners think everything has come to an end and everything is calm, everything will start anew. Two groups have always offered a wrong analysis of the green movement: an opposition which wants to overthrow the system, who interpreted the street protests as a “last action before the fall of the system” [a reference to Mohsen Sazegara] and the other group is conservatives who thought the green movement is the only obstacle towards a final stability of the system. (a writer in the conservative magazine Panjereh [Window] had declared the “end of history” right before a “final sin”; a sin that was the greatest sin of all and was the product of the devil). The green movement however is a reformist, peaceful civil rights movement with clear demands, which is stubbornly trying to create better living conditions for all citizens. Thus, this movement will continue to live beyond the frameworks of those two groups, and will continue to speak out of its demands to the rulers, in whichever way possible, – and not just street protests. With the eruption of every national or international crisis, there is the chance that more street protests will take place. Even though Ahmadinejad has spent a great budget giving charity to the impoverished populations, with growing inflation and unemployment, this group too has much to protest. Amir Mohebian was right when he said: “Mousavi couldn’t tie the struggle of the lower classes to that of the middle class” but certainly, Ahmadinejad is up to the task. 2- Reformists and their leaders will not stop protesting. But the protests of the pragmatic conservatives will be much more effective and useful when they stand with the green movement, and not when they are alone. One of the reasons the reform movement was defeated was that Saeed Hajjarian’s strategy of “pressure from below, bargaining from above” never materialized. There was no pressure from below, and those around presdient Khatami had no ability to bargain. The green movement is the restructuring and the reforming of the reform movement. When Hajjarian was in prison and was preparing for his televised interview, his strategies were being implemented outside prison. In an unwritten agreement, the people and the leaders of the green movement were pressuring [the ruling establishment] from below, and the bargaining was being done by the conservatives from above. This was an effective, realistic dividing of the responsibilities. 3- Up to this point, the hardliners have been defeated in their project. They have not been able to unseat Rafsanjani, and they have not been able to imprison Khatami, Mousavi and Karoubi. Even if Tehran does not see any other street protests, the political environment is so tense and inflamed that it will not allow them to carry out any other projects. But we must remember that the hardliners are so determined to take the next leadership of the country that they are willing to put the country under any pressure. In order to create extreme circumstances, they are even willing to go to take the country to war with neighboring countries. We know that a war is a good excuse to carry out certain political decisions inside the country. (Faridedin Adel, the son of Hadad Adel [hardline ex-speaker of parliament] has predicated in an article that Iran will be going to war with Turkey in the next few months). 4 – It has become quite obvious to the ruling establishment that the hardliners’ solution for the transfer of leadership is very very costly, and full of risk. And that even if this project was to succeed, sustaining it (in terms of its national and international legitimacy, economic difficulties, etc) would be near impossible. That is why we can be hopeful that in the future, the reformists and the pragmatic conservatives will also have the chance to put forth their solution. These solutions include democratizing the parliament and the Assembly of Experts, eliminating the approbation supervision of the Guardian Council and creating a “Council of Leaders”. The destination, was to begin the journey. We can clearly witness two defeats for the contemporary hardline Shi’a movement: the executions of Sheykh Fazlollah and Navab Safavi. Ayatollah Khomeini too left them dissappointed when establishing the Islamic Republic, by incorporating modern democratic institutions within the frameworks of the system. After the ayatollah’s death, the hardliners spent years trying to reclaim their century long pursuits. But in the last instant, with the rise of the “Imam’s prime minister” [Mousavi], a great movement took shape. The birth of the green movement was an end to the hardliner project, and stamped another disappointment for them in history. The family of Ayatollah Khomeini raised their voice in protest and many of the marjas [grand ayatollahs], even some of the most conservative, spoke out in criticism. If there is any group that is guilty of attempting to overthrow the system, it is the hardliners who wanted to overthrow the “Islamic Republic” and replace it with a “Shia Caliphate”. Mousavi had no choice but to disagree with such a move, even though it had a heavy price for him and the people. Mousavi consciously paid this price to steer the reformists out of deadlock, because the reform movement is the only way of saving the democratic aspects of the system, and saving the Islamic Republic. The hardliner project for eliminating the democratic aspects of the system was defeated with the birth of the green movement. The green movement reached its aim right at the start; whatever it might gain hereafter, are all added achievements. The destination, was to begin the journey.